In as little as 10 minutes, the Mega Power Worn Motor Oil Change Treatment ends an older motor’s wear caused power and performance problems. Those synthetic motor oil cannot end. Installed with regular oil makes for way better engine improvement than synthetic oil provides. This product will quickly return a like-near-new power to any motor - even yours! Is that a benefit you’re looking for? This is not some high-priced ad agency hype. Nor is it a new synthetic motor oil! It is a new anti-wear problem-solving chemistry. It is made to add to your engines and transmissions oils to help you gain years more service from your cars, before engine overhaul or car replacement is needed. Is that what you’re after? For both new, but especially older cars trucks and heavy equipment. For engines and transmissions and other components. What customers tell us - they say, "this Mega Power Worn Motor Treatment" does more for their older, even worn motors than couldn’t use synthetic oil - nor stop oil leaks or end oil burning, reduce friction, nor restore power, unless Mega Power was added. As this Mega Power Ingredient MC+ demo illustrates. Pictured below. Mega Power cleans the upper motor fuel injector, idle, air intake, combustion, valve, and catalitic converter - as well as your lower piston rings, valves lifters, and oiling system - as you drive. Then adds a long wearing protective anti-wear to every part! Restoring years more dependable service to their vehicles. Shown in the picture for mechanics; the Mega Power Product Feeder Cleaning Tool - $125, and usually bought by mechanics to let the tool install the yellow color product in the box with #3 on it. Lets mechanics do other work while the products cleans the motor automatically. Not needed if doing only one or two cars. Mechanics: order this long lasting tool here. This Mega Power tool - used in tune up, feul injector cleaning, emission smog system cleaning, and to restore lost power. Lets mechanics service that part of a customers car with Mega Power while the mechanic can work on other cars. Not needed if you're just doing one or 2 cars. I'll show you how to do the same professional service cleaning of your motor - any motor and get the same exact professional results with Mega Power in just 15 minutes, like they do - and for $200 less labor expense. Mega Power is a great car care motor invention - as you can see from what customers say about it. Those comments are not the exceptions, but, are typical product user experience. Mike says his motor went from sounding like terrible rock music off key, to having his motor sound like beautiful music, after installing Mega Power. In as little as 10 minutes the Mega Power Worn Motor Oil Change Treatment ends an older motor’s wear caused power and performance problems and quickly returns a like-near-new power to any motor! Order your motor treatment below. Mike says his motor went from sounding like terrible rock music off key, to having his motor sound like beautiful music, after installing Mega Power. You will too! Mega Power uses 6 ingredients. 3 are installed for top motor cleaning. That includes the fuel tank, filter fuel injectors, intake idle vale combustion piston and valves and catalytic mufflers. Something just adding synthetic oil cannot do. Those 3 products working with the other 3 in the lower part of your motor, stops top of your motor valve tap, and frees sticky piston rings. Ending oil burning, and blowby - all power declining negatives. The 3 other ingredients in the #2 box above, using MC+ - a metal conditioner, and a protective coating, cleans and smooths ou your pistons bearings valves and gear surfaces. Working where ever gas, air combustion, exhaust and oil travels removing your motors power robbing condittions. That's good! Besides removing metal-to-metal friction. penetrating ingredients free sticky rings valves - all without the need to tear your motor apart; the usual $3000 remedy. Something no synthetic motor oil can do. Installing Mega Power is easy. Directions are simple. JUst add the treatment in two steps a week a part. the second step is during your oil change. a week later. Major improvement begins with Step One ending problems motioned above end. After the oil change, driving restores any remaining missing power. Use with any synthetic or regular motor oils. Mega Power puts off overhaul need for several years. Overhaul is better, of course but run over $3000 and 2 weeks time without your car. Now for under $100 - and 15 minutes time, you can get years more car service from your older motor - and transmission - if you install it there, and keep your car or equipment enginne and transmission running great again, and your budget intack. Yes, works in transmissions, stick shift and 4x4 gears, and industrial equipment of any size, too. The Mega Power Worn Motor Oil Change Treatment. <p>The Picture shows the Worn Motor Oil Change Treatment.</B> It includes 6 items - because that is what restores power and dependability to older and worn motors. It is not in any synthetic motor oil. By adding the Mega Power Worn Motor Oil Change Treatment to your oil change you breath new life into - and again pull out of your motor, power, performance, and lasting dependability it had when near new - but wear and miles took it away. As long as no actual part is broken or worn out completely, all this is certain. Without Mega Power, wear-out continues at a faster pace. Lousy fuel economy continues, the Worn Motor runs less than ideal, you may suspect it could breakdown sooner than you expected. It may. The Mega Power Worn Motor Oil Treatment uses special chemistry to help cars and equipment run better, and longer - by ending performance wear problems oil cannot in our cars, trucks, RV's, and motorized equipment. Using Mega Power, wear-out goes from a faster pace - to a crawl. Lousy fuel economy changes to getting <i>20 to 40 more miles on each fill up. Synthetic motor oils won't do that becaise they keep things clean - but cannoty clean engine parts or reduce metal-onmetal friction as Mega Power does. Instead of the motor running less than ideal, it will again <i>start faster, idle smoother when cold, have more power taking off at red lites. It will run that way for years</i> - instead of giving you the anxiety that it may breakdown sooner than you expected. I love this Worn Motor Worn Motor Oil Change Treatment invention for all those reasons! Tens of thousands of car and equipment owners do to! I think you will, also. Try it and see. If ever dissatisfied - I'll refund the motor you spent to try it. I know this is what you need! Your cars smog-reducing sub-system is an engineering marvel that have made for smaller motors, yet producing more power, more fuel efficient, and self tuning. Cleaning of them is required to have your motor operate at its best. Problems develop deterring the motors running and limiting or reducing its full power development at that given moment. More serious, if left dirty, they produce new performance problems, and cut the remaining engine life in half. Synthetic motor oils do nothing about hat - but Mega Power does. The Mega Power Oil Change Treatment ends those problems and doubles or triples the remaining engine and transmission life. Is a product anyone can use to protect, prevent, and correct problems newer, and older, even worn motors all experience. Order a Worn Motor Oil Change Treatment for your car - one for all your cars! Get on down the road for many more years of happy, and trouble-free driving! This is the best way anyone knows of to protect your car investment! Of course, parts re-builders and new car manufacturers wish you wouldn't - and just stick to synthetic motor oil. They want you to spends thousands for their benefit - not help you avoid that repair, or costly replacement expense. A money-back guarantee assures you of no loss, if this is not what you need. Guarantee. Your money refunded if not delighted. 90 day period. No refunds requested - last 267 days. One Mega Power Worn Motor Oil Change Treatment.</B><br> Includes the 6 items needed for the treatment. Instructions. Personal help during installation. Guarantee. Price. $65+ $15s&h= $80 total. If you read this far and think synthetic motor oil is not what you want. Insread, you want to try this product, say you read the story and it offers a $10 discount if I ask for it. You pay $70 - not $80. Get $30 off two treatments. $130 total for 2 Treatments. Ask for it, OK? <B>If you have a question, or want to place an order, Call me day or evening. ... george, by calling me at 1 512 665 3388. Just $60 each plus 15s&h= $135 total. Save $25. <B>Order a Mega Power Transmission Treatment RS3 </B>also.<br> Protect the integrity of your transmission - and for smoother shifting. Includes a cleaner flush, a conditioner, and protector/problem-solver.<br><b>Just: </B>$50+ $15s&h= $65 total. <B>Order both </B>Engine and Transmission Treatment for one car. Same guarantee. Both delivered to you for $115 total. Save $25 on shipping. [Engine and Transmission Treatment shipped to you. $115 total]. <B>Order now</B> by calling - Call 1 512 665 3388. Get on down the road humming again! <B>Double above order for two cars. $200 total. </B>Free shipping. Save $80 - get this bonus. Our $12 Mega Power Lube and Penetrating spray for Free - Lubes, frees, stops anything squeaking, stuck, frozen. For home, shop, vehicle use. Mention this page. Offer Limited. [4 treatments + bonus spray lube shipped to you. $200 total]. Use two Treatments for large 5 to 8 gallon motor oil diesel truck engines. A similar treatment works just as well to end automatic transmission problems. Specific, if stick-shift transmission for its treatment. Shipped USPS or Fedex. <B>Order now, by calling anytime. Call 1 512 665 3388. Cause tapping noise, rough idle, stalling, oil burning, lousy fuel economy, and loss of power. You would think its telling you its worn out! Your motor is not worn out, yet even with synthetic motor oil does nothing for those conditions. An oil change does not clean the dirty affected areas. Nor does it end those problems - even if synthetic oil is used. The other way is to clean your motor and those sub-system parts is by a $3000 motor overhaul. But few do so as it's expensive. You usually wait until the car is not drivable, then have a mechanic tear into your motor and clean it. Cost is between $1500 and $3000 to do so - as you may already been told. If you did so, the car runs better afterward, but never perfect. So Mega Power researched, tested, and invented the way to do so as part of an upgrade oil change. But for around $150 - not $2000. Mechanics and quick lubes will be trained in this service over the coming years, but car owners can order the products and do it themselves. It is a simple process to do, and many have. They knwo synthetic motor oils and Mega Power. So, once a year say, "I want a Mega Power Worn Motor Oil Change, Please." If your local lube guy, or mechanic does not sell Mega Power, Order it here, on line. It is easy to install following simple instructions - listed below. An included with your order. Some lube and auto repair shops have a promotion. “Make it today, and get our Mega Power $12.50 All Purpose Penetrating Lube for free!” Online, you can get one for $6.95 with your order. Ask for it please. Frees anything squeaky, stuck, rusted, or needs a good lube. Your cars need Mega Power protection. Mega Power is the strongest engine cleaning treatment made. It has 6 cleaners for 6 motor areas – not just one. No concentration in any other brand exceeds Mega Power strength. Get it working for you! And we are often $20 to $75 cheaper in price than copycat, weaker products like BG! And, only Mega Power reduces actual friction. Not synthetic motor oil. BG, like some additives, depend on keeping things clean as a way to reduce friction. That's good! But BG cleans no better than Mega Power - and Mega Power reduces friction, TOO! BG does not clean the catalytic converter - another big smog reducing advantage the Mega Power purchaser enjoys. About Friction: Mega Power reduces friction to the lowest levels possible. This friction-reducing and problem-solving advantage is a power improving benefit the Mega Power car and equipment owner enjoys. Power is King! One other Mega Power advantage is its MC+ which fills worn areas of your motor and transmission. Filling worn motor part surfaces with MC+ brings back a motors smoother, quieter running. And, the transmission’s smoother shifting, and cooler running, for additional years longer dependability – a great product usage benefit. Mega Power does complex things. You add it and drive. Driving does the fix. Not any synthetic motor oil. Mega Power treats motors to a new, instantly stronger running life. It does so becauses it cleans, frees, coats, and protects every part in 6 sub sections of your motor. The "Worn Motor Oil Change Treatment" uses an easy-to-follow 2 step process. It works by adding 3 ingredients before, and 3 after your regular oil change. An odd idea, but it works well! By "cleaning and conditioning" every dirty, sticky internal part, the results helping your motor is immediately and permanent. See "metal conditioning" item, below. This improvement, which most people can see and hear working, keeps the motor running as if in a near-newer condition. My own usage, in 6 older cars and work trucks is amazing, in that those vehicles run up and down the freeway full speed, day after day, year in, year out - and you would have thought different about them - and not did that, were it not for Mega Power. Will it work in your case? That depends. 99 out of 100 people swear by it. Give it a try. Ordering info below. The Mega Power Oil Change Treatment provides performance and dependability advantages for under $100 - a budget-minded car owner may desire, that suits them for a year or two, as a practical alternative to spending $3000. Every motor eventually wears out - and fails. Discovered an upgrade motor oil change procedure using 6 ingredients that pushes a worn motor's fate off into the future. This, it does by getting the motor to run <u>as if it were not not worn out! Something synthetic motor oil cannot do! Mega Power is not</B> a fuel octane, or citane booster. Mega Power contains </B>the only known combination of ingredients that help older motors and transmission regain their former, like new power and performance - an anti-wear to extend your cars - truck tractor, RV's restored life, for years on end. Read on about</B> these beneficial advantages to revitalize your older motor. Not synthetic motor oil. Piston rings - when sticking,</B> lose their expandable wiping action, and like worn windshield wipers, allow oil to get pass them - into the upper piston combustion area. Mega Power frees the lower piston rings from the oil side, and the top "compression ring" from top side motor cleaning. Worn areas -</B> usually roughen up from years of contact, are cleaned, then smoothed, and finally sealed with a slippery, protective coating. That is the restoring process the Mega Power motor oil change no other product has or can provide! Those steps, what I call chemical revitalizing, is what overcomes your wear and worn motor problems. The Mega Power Worn Motor Treatment is what your car needs! Is a valuable </B>feature you should want for your new and older cars and machines if you want to avoid avoidable wear out, and extend their lives years beyond the average. Those combined Mega Power Treatment advantages</B></ul> is how anyone can restore great running performance to a motor showing age and Hi-mileage problems. No wrenches, nothing to take apart!<B>$3000 engine overhaul. Price: $125 Free shipping. Not needed except by mechanics who do save a little time using this feeded. It can be rented for a week for $25. A $100 charge if you want to keep it, or if not returned in the allowed time. Made for rugged daily use by mechanics. Order a <B>Mega Power Transmission Treatment RS3 </B>also.<ul> Protect the integrity of your transmission - and for smoother shifting, stops leaks. Includes a cleaner flush, a conditioner, and protector/problem-solver.<br><b>Just: </B>$60+ $15s&h= $75 total. <B>Order both </B>Engine and Transmission Treatment for one car. Same guarantee. Both delivered to you for $125 total. Save $30. [Engine and Transmission Treatment shipped to you. $125 total]. Order 2 treatments for 2 cars, receive our $12 Mega Power Lube and Penetrating spray-for Free. this lube frees anything stuck, rusted, or squeaking. For home, shop, and vehicle use. Mention this page. Offer Limited. [2 treatments + bonus spray lube shipped to you. Please ask for this special]. <B>Order now</B> by calling me, george - Call 1 512 665 3388. <B>Fleet, Lube and Tune, Parts store, and Auto Repair owners.<ul></B><br>Order 6 MP Worn Motor Treatments for 6 cars. Free shipping. $300 total. Mega Power provides the same revitalizing advantage for your transmission and other componnents - wherever added. "Surprisingly, your Mega Power Worn Motor Oil Change Treatment <u>restored my 1995 Honda's power problem</u> by adding the products to those areas you said too - not just in the gas for fuel injectors," Navaren, an Engineer from Chicago, says. </li><br><li> "The Mega Power Worn Motor Treatment <u>ended my engine noise and tapping</u>, in just a few minutes, following the steps you said to follow. I think the cleaning and treatment restored full oil circulation again. The oil pressure gauge needle use to drop at idle, It stays up at normal all the time, now." says DT, from California. </li><br><li> "The Toyota Dealer tuned my near new Toyota SUV 3 times for nearly $900, and could not end its rough idle problem. I found your web site, and decided to order two of your transmission, and two of your worn motor treatments, as they sounded like what my wife and my cars really needed. The Worn Motor Oil Change Treatment is what I promise will work for your car too! This report details what the product - the Worn Motor Oil Change Treatment does to end your motors wear and performance problem. Because that is what it takes to work on 6 areas of your motor - not just the oil, like old fashion products do. You may know that old fashion products like Valvoline, BG, Lucas, and Restore - and those sold in parts stores, can't do the job Mega Power does. I've tested them all! Here is the list of what Mega Power has to do the job quickly and permanently. Save </B>your worn motor and your budget. Try Mega Power and avoid a $3000 engine overhaul. Your money refunded</B>if not delighted after a 90 day period. No refunds requested - last 267 days. Price: $125 Free shipping. It can be rented for a week for $25. A $100 charge if you want to keep it, or if not returned in the allowed time. Made for rugged daily use by mechanics. Order a <B>Mega Power Transmission Treatment RS3 </B>also.<ul> Protect the integrity of your transmission - and for smoother shifting, stops leaks. Includes a cleaner flush, a conditioner, and protector/problem-solver.<br><b>Just: </B>$50+ $15s&h= $65 total. <B>Order both </B>Engine and Transmission Treatment for one car. Same guarantee. Both delivered to you for $125 total. Save $15 on shipping. [Engine and Transmission Treatment shipped to you. $125 total]. "I mostly work on Mercedes and BMW's. </B>I install and thought Amway was good for these and my cars, It is. But, Mega Power solves friction and wear problems Amway can't - in areas where Amway can't go, like cleaning the motors Emission system, cleaning power deterring, sticky pistons rings, and slow-closing valve problems. And by reducing the friction drag piston and bearing wear causes. Most everyone knows motors get that way over time. They just live with it - or trade the car, truck, or RV off for new - and let someone else worry about it. This treatment - as part of whatever the customers car tune or repair needs are, end its hidden power-loss and wear problems. Customers are amazed at how good my repairs and tune ups are - since I started using your Mega Power Worn Motor Treatment in every car I work on. "ET, Mechanic. Houston. Also, from Houston. Gary, owner of Gary's Engine Machining and Engine Rebuilding, - who does rebuilding for Houston area automotive, industrial, and marine engine shops, companies, and individuals, says...."
For many years, Mega Power has been the assembly-lube for all our engine rebuilds. It smooths the friction break-in process almost instantly, and ends the #1 caused of common engine rebuild failure problems. I make sure my customers keep Mega Power in their new rebuild at oil changes, to keep the performance up. Mega Power is my secret for great long-term, engine overhaul performance success. My customers agree. And many buy Mega Power from me for all their other cars, diesel trucks, and such - to help them run better, and longer." Gary. "My leak stopped in two days, No more oily drips on my driveway to track into my house. and my older Chevy Malibu runs like it has a new motor. I thought it was worn out!" BT. Mega Power's cleaning, freeing, smoothing, and coating, of worn pistons, bearings, valves, and gears is remarkable! The other is Mega Power's ability to "smooth wear-roughen surfaces" that create more friction. Growing amounts of friction over time consume engine horsepower. Power that should go to make the car go, say 65 miles or 70 miles an hour speed, but now slows it to 65, or 60 mph. To go the needed higher speed you press the gas pedal down a bit - and keep others cars and diesel trucks from running over you. Right! And you do not pay attention to the gradual change. Most other brands just clean - and not that well, anyhow. They use harmful solvents to clean - but solvent additives destroys oils lubricity. Destroying lubricity is not good! Cleaning, freeing, smoothing, and coating of worn pistons, bearings, valves, gears, and sub-systems, wherever fuel, air, combustion, exhaust and oiling goes - is the remedy. This method safely ends performance, power loss, and other such problems cause by added friction drag, sticking and binding, wear, age, and mileage. <span style="color: #8B0000 ;"><B>Compared to overhaul cost, </B></span> this product is not that pricey, at $75... <ul>And, its guaranteed of satisfaction or your money back, comes with the product! This product is easy to install by any one - not just a tech or mechanic. Simple to follow instructions come with every treatment. <span style="color: #8B0000 ;"><B>Mega Power's Worn Motor Oil Change Treatment - Pictured above</B></span> is a product anyone can use to protect, prevent, and correct problems newer, and older, even worn motors all experience. Order a Worn Motor Oil Change Treatment for your car - all your cars! Get on down the road for many more years of happy,and trouble-free driving, again! This is the best way anyone knows of to protect your car investment! Of course, parts re-builders and new car manufacturers wish you wouldn't. They want you to spends thousands for their benefit - not help you avoid that repair, or costly replacement expense. Get your Worn Motor Oil Change Treatment. Order now! Your money refunded if not delighted. 90 day period. No refunds requested - last 267 days. One Mega Worn Motor Oil Change Treatment.</B><br> Includes the 6 items needed for the treatment. Instructions. Personal help during installation. Guarantee. Price. $65+ $15s&h= $80 total. <B>Order Two Worn Motor Oil Change Treatments</B>to protect 2 cars.<br> Just $60 each, and just $15s&h for both. $135 total. Save $25. 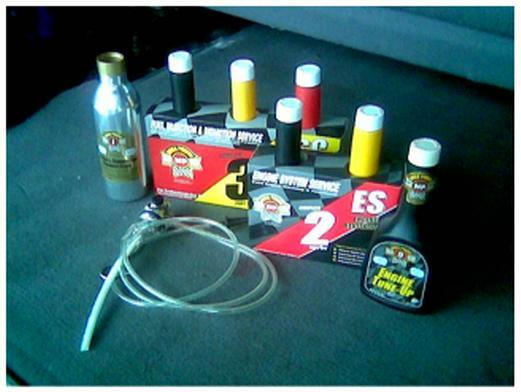 <B>Fleet, Lube and Tune, Parts store, and Auto Repair owners.</B><br>6 Worn Motor Oil Change Treatments for 6 cars. Free shipping. $300 total. <B>Order the Mega Power Transmission Treatment RS3, too,</B> to protect the integrity of your transmission - and for smoother shifting. Includes cleaner flush, conditioner, and protector problem-solving items.<br><b>Cost: </B>$40+ $15s&h= $55 total. Order both Engine and Transmission Treatments. Save $25. Same guarantee. Both delivered to you for $115 total. <B>Order now, get on down the road humming again! <span style="color: #8B0000 ;"><B>You may need a tune up </B></span>to replace defective spark plugs; perhaps a sensor gone bad, or whatever. That helps get the spark right again and is needed. As new, shinny pistons, bearings valves and gears rub and wear, more friction develop - and this slow down the road speed from say 70mph to 65, or 60. <li>To go the higher speed you feed the motor more fuel to overcome the greater amounts of friction drag cause performance problems, waste oil and gas. <li>Dirty combustion, air intake, fuel system, and catalytic converters - when dirty take a combined slow the fuel air flow and blending - for a bit less power development. We get those customers back buying Mega Power because of its many advantages to keep their cars going strong. This cushions our loss - and often times picks-up new word-of-mouth customers for us. <span style="color: #8B0000 ;"><B>So, you are welcome to try Mega Power at no risk </b></span>to see if it is the solution to your problem or not. Just tell us, if not, and we gladly refund your cost. No refunds asked for last 267 days. The Worn Motor Oil Change Treatment Refresher. One, MP Motor Oil Change Refresher #MPES3 $35+ $15s&h= $50. Order two or more treatments, $35 each, and Free shipping. Save $30. Use the Refresher, during each future oil change interval, to keep the treatment refreshed. An Oiling and Hydraulic Lifter System Cleaner. Oil and Friction Modifiers. A Fuel System Cleaner. A Fuel Injector Cleaner. An Emission, Combustion System Cleaner. A Coating to fill worn areas. It is this chemical combination we found, working together, does the following Cleans, seals, and coats pistons, bearings, valves and gears. To restore worn-away surfaces. Again produce the power it lost. That cleans improperly fogging fuel injectors, end misfiring spark plugs, certain sensors, touchy, power-robbing emission recirculating valves. Ending fuel wasting problems. And heals those worn, roughen, fast wearing surfaces that absorb the motors power, instead of sending it to turn the wheels. And finally, fills the worn-away areas so pistons, bearings, valves, and gears are tight-fitting again - one more compression, combustion, and vacuum boosting advantage that restores worn away power and performance. That is how new power re-appears, go to the gears and wheels - not spent on overcoming friction. It takes 6 different products</B></span> in the Worn Motor Oil Change Treatment to end the causes of excessive friction drag, problems, and rapid wear-out. Much like taking several prescriptions can keep you healthy, end certain plaguing problems you have. And Mega Power happens to be the only company with them all. Recommended for motors 4 years old and older. Even worn out motors. For details on products for new cars and trucks, click the New Car Button, on the left. Mega Power's New Worn Motor, Oil Change Treatment main benefit gives high-mileage, worn motors, years of new life. Don't just change your dirty oil! This method replaces dirty oil for new, and revitalizes your motor, too! "By using the this "Worn Motor Oil Change Treatment"</B> each oil change, my oil stays healthy way pass 6000 miles. A simple test you do shows this, and when its time to change - nearly always after 6000 miles. Stage one </B>is applied to the top of the motor, using 3 different products - one for the fuel tank, one for oil, and one for spraying the throttle plate, or as a vacuum feed into the motor. I show you how. The second stage is installed during an oil change a week after the above service - and has 3 parts, and goes like this: Add the "special cleaner," to dirty oil 5 minutes before changing the old oil. Two. Add the two different "oil" and "engine conditioners," on top on the new oil. Your are done installing the product. The motor will start and run and perform like it did when running its best. That is my promise and guarantee of what you will gain from this great invention. Tip. Redo the step two - not step one, at each oil change to renew the effect - for years more of great service out of your vehicle. The Worn Motor Treatment addresses the whole engine problem. The improvement is noticed immediately. Results last one year. Use the MP ES3 Kit to refresh and maintain the improvement. Doubles the time between oil change intervals from 3000 miles to 6000. Oil test verifies. Sold Money Back, if not as advertised. Includes: 6 products. Instructions. Guarantee. Price. $60+ $15s&h. Total $75. Order two or more treatments, for other motors you want to protect. Just $60 each, and Free shipping. Save $30. $50 per kit. $300 total. Free s&h until 6/30/13 Visa M/C Sorry. Or... Call in your order. Call me at 512 665 3388 if you have a question or to oder Mega Power. The Older Motor Refresher. One, MP Motor Oil Change Refresher #MPES3 $35+ $15s&h= $50. Order two or more treatments, $35 each, and Free shipping. Save $3 Use the Refresher, during each future oil change interval, to keep the treatment refreshed.